One of the most reliable and beneficial IT security certification programs and courses offered by Brainmeasures at present is the information security certification course. The information security course offered by Brainmeasures is a huge help if you wish to understand how to protect all the vital information of an organization against all types of attacks including any breach or intrusion to confidentiality. Enrolling in this online certification course from Brainmeasures allows you to receive a high quality and well-detailed information security training which covers all the things that you can do to protect sensitive information stored within a network including the basics of protecting them using a password, malware and anti-virus software, privacy laws, codes and ciphers and firewalls. You can also expect to receive a great deal of information about establishing an effective business continuity and disaster recovery plan in case of lost and damaged data. Considering the comprehensiveness of the information security certification course offered by Brainmeasures, you will never find it hard to pass the online information security exam and finally receive your hard copy certificate. 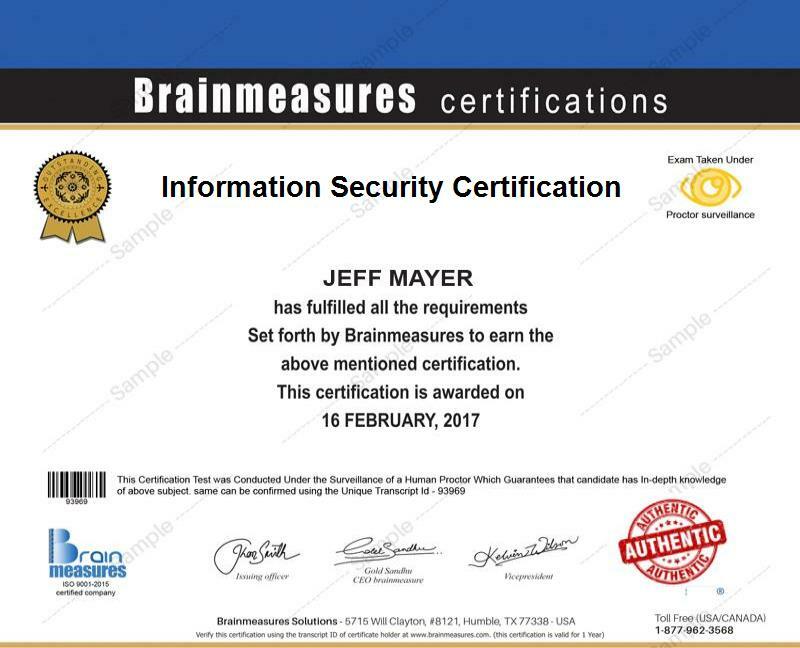 A lot of businesses, individuals and professionals are going to receive a lot of benefits from taking part in the information security certification program which is now easily accessible at Brainmeasures. It is specifically designed for security managers, security directors and any other IT professionals who are responsible for enterprise or organizational security, overseeing breaches to security and protecting sensitive and classified information resources from a wide range of threats caused by information warfare, computer crime, terrorism and espionage. Information security certification holders can expect to earn a more stable flow of income considering the fact that their services, skills and expertise are greatly needed in various organizations, fields and industries. If you use your information security certification to work as an information security analyst, then you can earn around $34,000 to $105,000 annually. If you work as an information security engineer, then your annual salary can range from $68,000 to $133,000. Those who are holding managerial and directorial positions in the information security field also earn a stable salary of around $117,000 per year. Chief information security officers, on the other hand, enjoy an annual salary of approximately $167,000.